What took Mother Earth millions of years to do, can be done in just minutes at Bio BTX in Groningen. 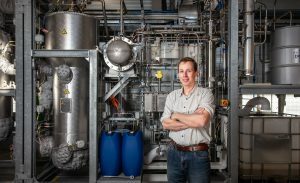 This startup, in a unique pilot plant, makes biobased aromatics – indispensable raw materials in the chemical industry. They have the same properties as aromatics from petroleum – a big step towards greening the chemical industry. Sparkling and shining, this unique machine has been running in Groningen since the summer. At one end, raw materials are entered that would otherwise be used much less efficiently. Currently this is glycerine, a waste product from the production of biodiesel. 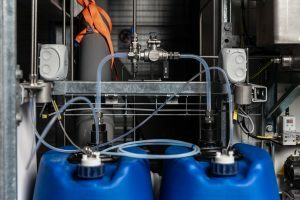 Coming out at the other end are crude benzene, toluene and xylene (BTX), valuable building blocks, so-called aromatics, for the chemical industry. In conventional industry, they are made from petroleum. It is a wonderful process. Technicians know that it works, yet much fundamental research is still needed to understand exactly what is happening. Just as the Earth made oil from plant and animal remains over millions of years, the pilot plant is producing the same from glycerine at a far more accelerated pace. This is new and the way in which it is happening in Groningen is unique. The chemical industry is in the middle of a ‘greening process’. Dependence on fossil fuels needs to be considerably reduced. And the Groningen-based BioBTX has part of the answer. “We are constantly trying to fit the pieces of the puzzle together,” explains Niels Schenk, the technical director of BioBTX. “Fundamental questions about the chemical reactions that occur, but also technological issues. How could it be better, even more efficient?” This puzzling happens partly at the University of Groningen, where a large group of students, PhD students and researchers are working on the underlying technological and chemical principles in collaboration with BioBTX.